Permaculture is a way that one person or one small group can make a real impact on the fate of the world. Our permaculture courses empower you with tools and skills to work with your environment – wherever that is – to create oases of balance, harmony, beauty, function and sustainability. Permaculture classes that prepare you to create the future you want to live in. This is our Flagship program. Go way deeper than other Permaculture Design Courses. Learn building, wild foods, forest gardening and primitive skills, as well as standard PDC course content near Asheville, NC. We meet for one 3-day weekend-a-month for 8 months, which allows the knowledge sink in. This permaculture class empowers students to become effective ecological designers and planners. You will come out of this class with deep knowledge about creating forest gardens, ecology, permaculture principles, plant species and variety choices, holistic forestry, and more. Our Apprenticeship Programs equip participants with the skills they need to live with the web of life: natural building & tiny house construction, foraging & wildcrafting; hide tanning & basket-making; permaculture design & organic gardening; herbalism & nature connection; functional communication & community living; storytelling; deep ecology; and much, much more! Changing the world through a class might sound pretty idealistic, but our permaculture courses are anything but. That’s because we’ve created curricula that don’t just cover big ideas and theoretical scenarios. 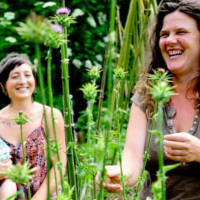 Permaculture training with Wild Abundance is practical and realistic. All of our instructors bring life experience to the table. Many of them have been practicing and living permaculture for decades! Permaculture design courses that are rooted in real-world experience and practical know-how. Permaculture education is for everyone. We’ve had students from all kinds of backgrounds and lifestyles. With this in mind, we offer several different ways to earn your Permaculture Design Certificate. 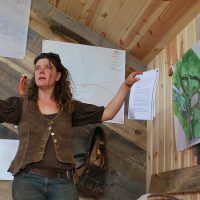 The traditional, intensive Permaculture Design Course is a 10-day workshop where you live and breathe permaculture. It’s full-on, fun and free of distractions. In fact, we even offer a meal plan option. It provides you with amazing food and the time to focus more completely on your studies and design project. If taking 10 days off in a row isn’t possible for you, or if you want to give yourself more time to let the knowledge percolate, don’t worry. Our Immersive Permaculture Design Certificate Course offers just that, and more. It’s a series of long weekend workshops over the course of a whole growing season (April – November). In addition to the 72 hours of content that is required for all Permaculture Design Courses, we include more than 100 additional hours in the immersion. Relevant, complementary content broadens and deepens what this class provides. For those of you who want to learn permaculture by living it, we welcome a few folks to our homestead each year as apprentices. Becoming a permaculture apprentice includes participation in both of the options above. Plus, you get a place to live in the most beautiful spot on the planet (okay, maybe we’re a little biased). We give apprentices one-on-one guidance, so each person gets a learning experience that’s tailored to his or her unique style. Plus (yes, there’s more), apprentices get to participate in all of our other classes and programs. There are three different apprenticeship options, so if this is for you, check them out at our Permaculture Apprenticeship page. The people and planet need your unique contribution. Join us for a Permaculture Design Course. Now is the time to take action. Ecological and social degradation are not waiting on us; they’re barreling ahead at full speed. With this in mind, solution-oriented change makers (like ourselves) need to dive in and move at the same speed. But you don’t need to know all the answers or fix the world’s problems alone. Taking a permaculture design course is a first step. It will get you ready to make positive changes right now, where you’re at. We believe that a healthy, sustainable future needs lots of empowered individuals. With permaculture, working at the community level who understand systems-thinking. We are looking forward to meeting you and sharing our knowledge as we weave this web of change!